Around the nation, and even in Compton itself, people are asking the same question: How is Compton doing it? How has Compton Unified School District become one of the nation’s great education turnaround stories? 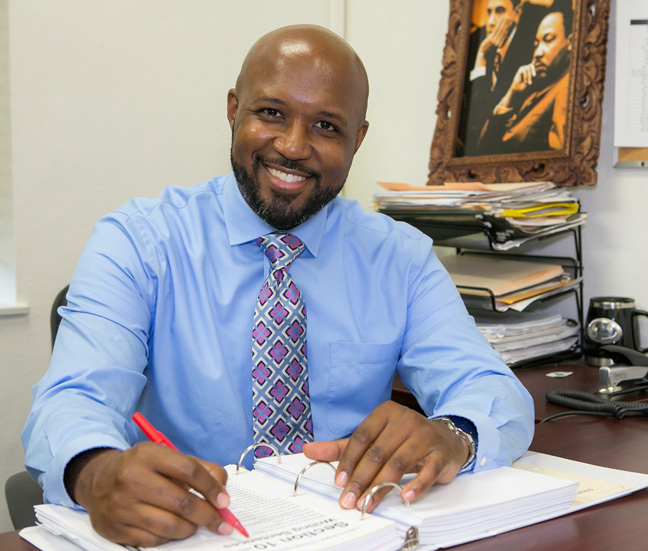 “It started with a vision that the Compton schools could be a model for how an urban school district focused on student success could change lives for the better,” said Micah Ali, who is president of the Compton School Board. A vision is one thing, but executing that vision is the challenge. And Ali says the community, teachers, staff, administration, school board and most importantly the students themselves have worked hard. As most well know, things weren't always so good in the Compton schools. In fact just four years ago, the district was wallowing in red ink, with a $30 million operating deficit. The district was suffering from what had been some bad management. The School Board appointed Darin Brawley as Superintendent. Brawley, a no-nonsense administrator put a fiscal team in place—appointing Alejandro Alvarez the chief budget officer and streamline how Compton managed its money. The last four years of what Ali calls that “relentless focus” has paid off. • Two Schools (Jefferson and Tibby) are named National Blue Ribbon Schools—the only school district in California to have two schools named. • Dominguez High school students Jennifer Barrientos and Azcuena Castro win a national engineering design competition (MESA) for an economical prosthetic arm design for amputees. • Two other Dominguez students—Luisa Rosa Silva and Amir Teixeira were named Gates Millennium Scholarship Winners. Luisa is now at UC San Diego and Amir is at UCLA. • Compton High school beat over 1200 schools nationally to win the Taco Bell Foundation’s effort to support student success. So what can other school districts learn from the Compton turnaround? Talk to school reformers and they'll tell you that a principal who is an entrepreneur and can both inspire and listen to teachers is a recipe for turning around a school. Find enough of those principals and you can turn around a district. “In addition, we’ve invested literally millions of dollars in professional training for our leadership and our teachers,” said Ali. And on the issue of student safety, one of the key strategic objectives defined by the district, Ali says that Compton campuses are safer than many in more affluent communities. The reform doesn’t stop with what has already been achieved. Compton continues to evolve its programs with a focused emphasis on getting its students college and career ready. Compton has made great improvements in the classroom, but many of those classrooms are in desperate need of repair. In particular, Compton High School, over 100 years old, needs to be replaced. This November, Compton is asking the voters to approve a bond that will let us build a new Compton High School, replace an elementary school and fund other improvements. Compton has even created a new website called www.comptonschoolsuccess.org, which trumpets the progress that the district and its students are making.